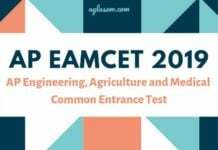 AP EAMCET 2019 Admit Card – JNTU Kakinada, on behalf of APSCHE, has released AP EAMCET 2019 Hall Ticket on April 16, 2019, at 12:45 PM. Students can download the hall ticket at sche.ap.gov.in/EAMCET/ from the link below. Enter registration number, qualifying exam hall ticket number, date of birth to login. Download EAMCET Hall Ticket and take it to exam center along with other relevant documents on the day of CBT. Engineering, Agriculture and Medical Common Entrance Test is scheduled to be held from April 20 to 24, 2019. 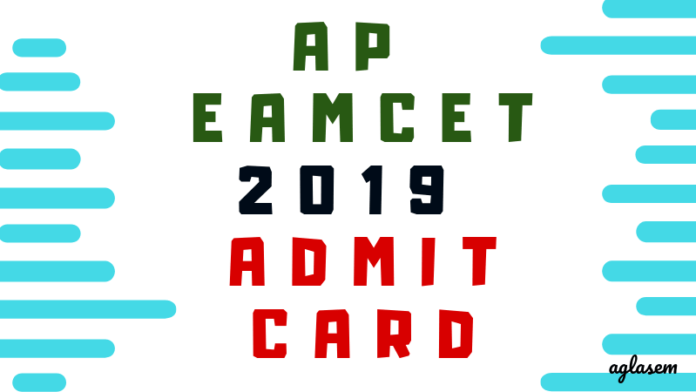 Get here complete details of AP EAMCET 2019 Admit Card / Hall Ticket including the link, how to download, forgot registration number and other information. Latest: Admit Card of AP EAMCET 2019 has been released. Download from link below. JNTUK does not send the hard copy of the AP EAMCET Admit Card to the candidates individually, and hence, it is to be downloaded by online mode only. How to Download AP EAMCET 2019 Admit Card if Forgot Registration Number? It is important that the candidates must have all the necessary login details ready with them to download the AP EAMCET 2019 Admit Card. One of the necessary information is the Registration Number. If a candidate does not remember their registration number, they must check their registered email id, as the exam conducting body must have the registration details on their email id. 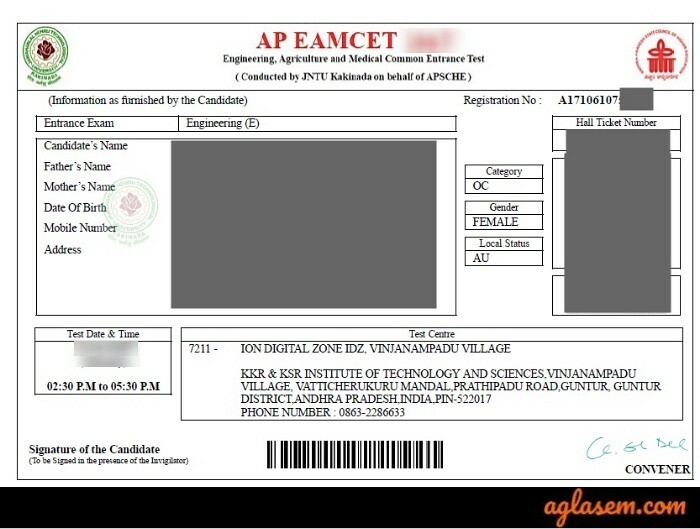 Another way to get the Application Number for AP EAMCET Login is through the print out of the confirmation page of AP EAMCET Application Form. How to Download AP EAMCET 2019 Admit Card? The admit card for AP EAMCET 2019 is issued by online mode only. The candidates can download the AP EAMCET Admit Card 2019 by simply following the instructions as given below. Step 1: Click on the direct link which is provided on this page for downloading the AP EAMCET 2019 Hall Ticket. Step 3: On entering the details, click on the “Download Hall ticket” button. 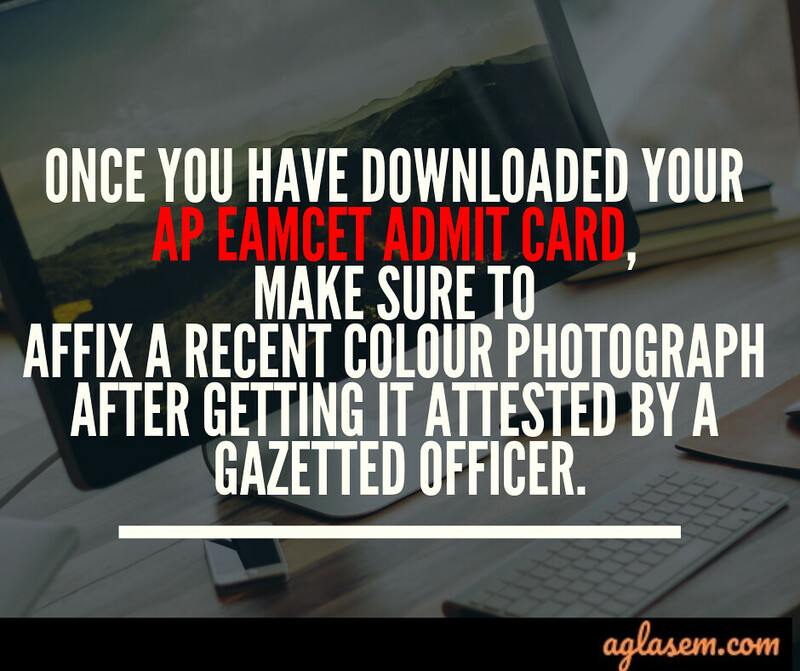 Step 4: Download the AP EAMCET Admit Card on your device and then finally take its print out. What to Do if Unable to Download/ Error in AP EAMCET 2019 Admit Card? 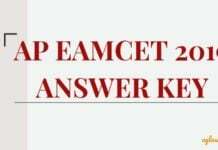 What to Do After Downloading AP EAMCET 2019 Hall Ticket? Affix a duly attested recent colour photograph. Only a Gazetted Officer (or) Principal of the College can attest it. There will be space for signature and Left Hand Thumb impression. Candidates will have to fill these details in the presence of Invigilator on the exam day. 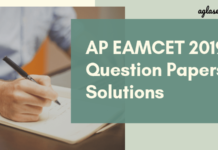 What Documents to Carry to AP EAMCET 2019 Test Centers? Now, before the candidates proceed to download the AP EAMCET 2019 Admit Card, take a look at the important chapter for the entrance exam. Before downloading a copy of the AP EAMCET Admit Card, a candidate needs to check these details whether printed correctly or not. In case of any discrepancy, the candidate should contact the JNTUK and get it rectified at the earliest possible. Date and Time of examination. Out of these available exam dates and time, the applicant is allotted a particular AP EAMCET 2019 session and date to appear for the exam. The exact details, allotted to a candidate is printed on the AP EAMCET 2019 Hall Ticket only. The AP EAMCET 2019 Admit card consist of the test center allotted to them. The allotment of AP EAMCET 2019 Test Center is done on the basis of the choice submitted by the candidate in the AP EAMCET 2019 Hall Ticket. The candidates can check the list of AP EAMCET 2019 Test Centers from the table below. There will be 160 multiple choice questions for each stream all questions will carry 1 mark. Therefore, the paper will be of 160 marks in total. There shall be NO NEGATIVE marking for incorrect answers marked by the candidates. 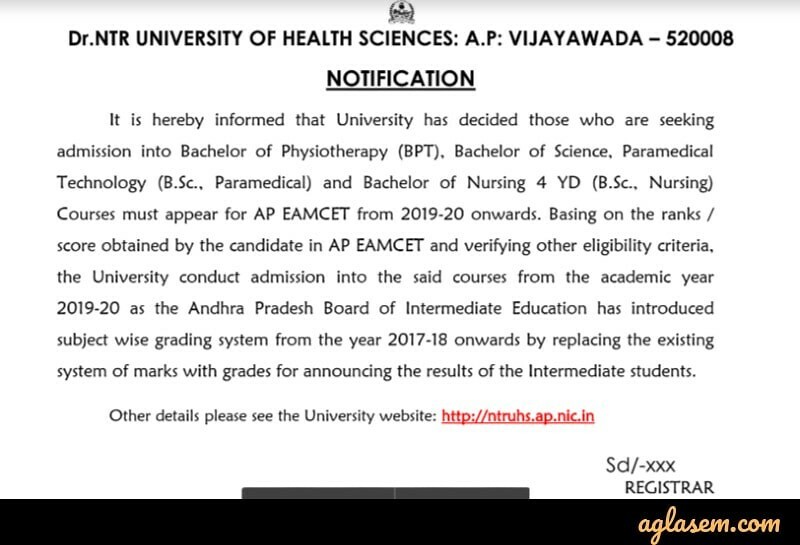 As per the official notification released by JNTUK, the candidates who wish to take admission into BPT, Bachelor of Science, BSc Paramedical and BSc Nursing have to appear for AP EAMCET 2019. The candidates are offered admission to the following courses is provided on the basis of score obtained in the entrance exam. JNUTK is conducting the AP EAMCET 2019 in online mode. Some students may find it difficult to operate the computer device for the test. In order to help the students, the exam conducting body has answered to the frequently asked questions for the candidates. Check the FAQs on CBT from the link below. Andhra Pradesh Engineering, Medical, and Agriculture Test (AP EAMCET) is a state level entrance exam which is conducted by Jawaharlal Nehru Technological University Kakinada (JNTUK). The score for AP EAMCET is used for admission into various professional courses offered in University/ Private Colleges in the state of Andhra Pradesh. Below, we have provided you with the answers of the queries/doubts, that a candidate has related to AP EAMCET 2019 Admit card. Q1. Can I locate the exam centre? If so, then how? Ans. With the help of the exam centre route map, a candidate download and print the test center location, along with the admit card. Q2. Can I change the exam session allotted to me, over my AP EAMCET 2019 Admit card? Ans. No. Candidate needs to appear for AP EAMCET 2019 Admit card on the session, allotted to him/her. Q3. On the day of the exam, where can I find the seating arrangement? Ans. An applicant can find the seating plan over the notice board at the exam centre, on the day of the exam. Invigilators also help a candidate in guiding to their allotted computer labs. Q4. Are student biometrics taken on the day of the exam? Ans. On the day of AP EAMCET 2019, a candidate needs to go through document verification round. After this round, a candidate is guided towards the biometric round. The photograph and right thumb impression is also taken during this round.